A compact design combining a wide sweeping path, excellent manoeuvrability and enough power for a ramp climbing capacity of up to 20%. Riding the new Nilfisk-ALTO FLOORTEC R570 you can cover large areas of floors and get the job done quickly, effectively and with maximum driver comfort. 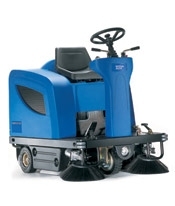 The FLOORTEC R570 is also a robust sweeper designed to withstand tough working conditions indoors or outside. Perfect ergonomics, user-friendly operation and low maintenance costs are among other significant advantages. Nilfisk-ALTO FLOORTEC R570 means dust-free and trouble-free sweeping 365 days a year. Two side brooms sweep a wide path. control on the panel improves ergonomics and safety. for continuous dust free sweeping. motors for protection and reduced maintenance costs. Flap lifting device for picking up large debris. Operator entry from either side for superior ergonomics.